United States: present in most states, concentrated in the eastern and central regions of the U.S.
Worldwide: Australia, Canada, Europe, Ethiopia, Haiti, the Mediterranean region, Mexico, Morocco, South Africa, South America, and many Pacific islands. Most likely native to Central and South America but now cosmopolitan. 8.38 mm (0.33 in.) in length. Brownish to grey with intermixed white scales that form a diagonal mark on the hardened forewings (elytra). The hardened forewings (elytra) over the abdomen are fused, so the insect cannot fly. Bulging eyes on the sides of the head. Short blunt snout tapers slightly downward. Size of mature larvae or grubs 10 - 12 mm (0.39 - 0.47 in.) long. Head capsule is 1.75 mm (0.069 in.) wide. Grubs yellow at first, becoming white after a few days and creamy white before maturation. Yellow head capsule and black mandibles. Kidney-bean shaped with distinct segmentation on the body. Diameter 1 mm (0.25 in.). All Citrus species and their hybrids. Consumption of entire leaf except the mid-rib. Larvae may damage lateral roots as deep as two feet. Complete girdling of roots may occur. Root damage similar to Diaprepes abbreviatus and Pachnaeus spp. Sticky egg masses under the calyx of the fruit stem. Females produce egg masses asexually (parthenogenesis) containing 5 - 40 eggs covered by a white sticky material. No males have been discovered. On citrus, eggs are deposited beneath the calyx, on the fruit, in cracks in the bark, and between leaves. The eggs hatch after three to four weeks, and the larvae fall to the ground where they feed on plant roots for 6 - 10 months. To pupate, the larvae move near the soil surface and form a cell made of soil. In Florida, peak emergence occurs between June and September. In California, peak emergence occurs between June and November. The flightless female beetles climb their hosts to begin feeding. One generation is produced each year. The Fuller rose beetle is known by several synonyms, including Asynonychus godmani, Asynonychus cervinus, and Naupactus godmani. The Fuller rose beetle feeds nocturnally. Adults are not attracted to ultraviolet light, and larvae move away from light (negatively phototropic). Coats, S.A., and C.W. McCoy. 1990. Fuller rose beetle (Coleoptera: Curculionidae) ovipositional preference on Florida citrus. J. Econ. Entomol. 83: 860-865. Futch, S.H., C.W. McCoy, and H.N. Nigg. 2009. A guide to soil insect pests identification. (http://edis.ifas.ufl.edu/pdffiles/HS/HS13000.pdf). King, J.R. 1958. 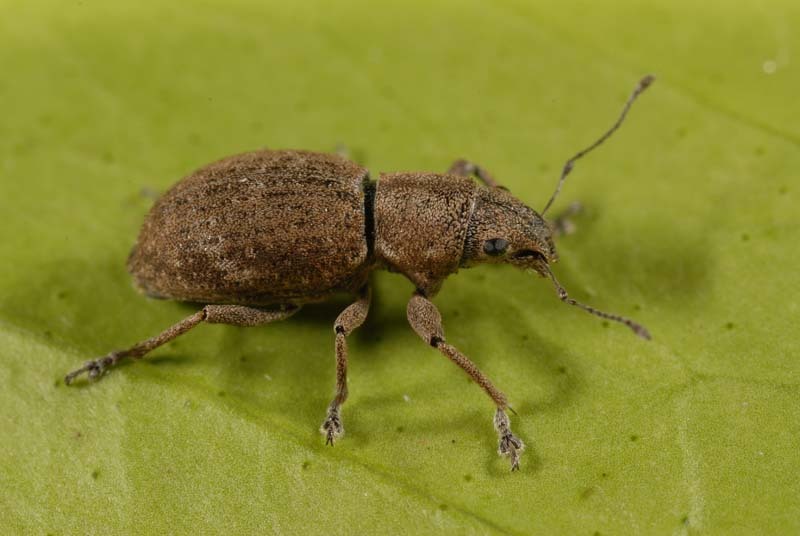 Occurrence, distribution and control of Fuller's rose beetle in Florida citrus groves. Proc. Fla. State Hort. Soc. 71: 146-152. (http://www.fshs.org/Proceedings/Password%20Protected/1958%20Vol.%2071/146-152%20(KING).pdf). Flint, M.L., and M. Fayard, (eds.). 2009. Fuller rose beetle - Asynonychus godmani. In How to manage pests: pests in gardens and landscapes. (http://www.ipm.ucdavis.edu/PMG/GARDEN/PLANTS/INVERT/fullerrosebeetle.html). Woodruff, R.E., and R.C. Bullock. 1979. 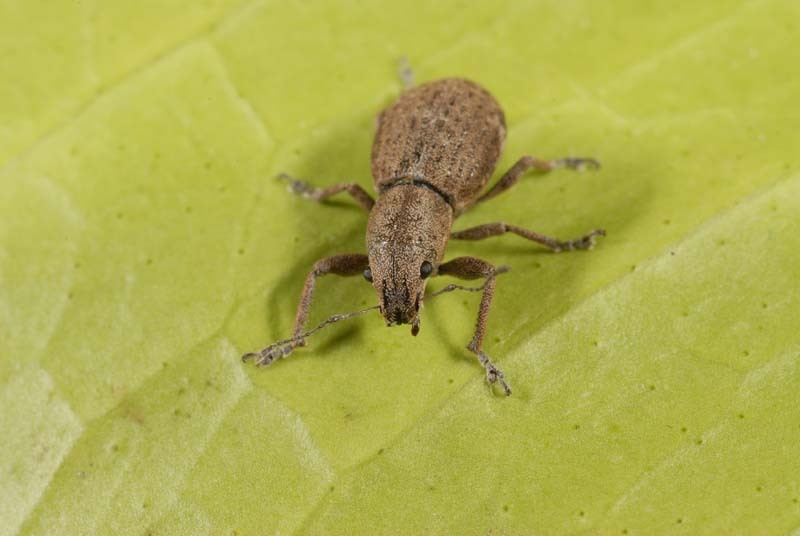 Fuller's Rose Weevil, Pantomorus cervinus (Boheman), in Florida (Coleoptera: Curculionidae), Entomol. Circ. 207. Fla. Dept. Agric. Consumer Svcs., Div. of Plant Industry (http://www.doacs.state.fl.us/pi/enpp/ento/entcirc/ent207.pdf).